In 2016, legendary guitarist Ritchie Blackmore made a long awaited return to rock after years of only playing folky medieval music with his band Blackmore’s night. He played a tiny handful of gigs in Europe and none elsewhere, with a new Rainbow lineup that featured an unknown singer, Ronnie Romero on vocals. Following the tour, a DVD was released of the German show, followed by a CD release of the Birmingham show. At that point many people expected Ritchie Blackmore to return to medieval music with Blackmore’s Night, but instead they went on to do some more live shows in 2017. The setlist for these shows was changed significantly from the 2016 dates – still a mix of Rainbow and Deep Purple songs, but with more Rainbow songs. I enjoyed both 2016 and 2017 Birmingham shows, but felt that in 2017 they performed better as a band, with Ronnie Romero in particular looking more at home on the large stage. Now there’s a CD release of the 2017 tour. It’s a double CD with a bonus DVD. 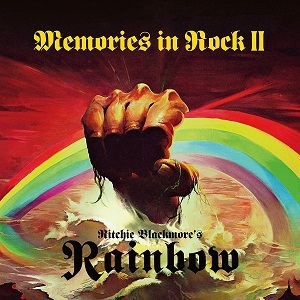 The DVD is mainly interviews with Ritchie Blackmore and the other singers and musicians involved in the show. The CDs are what most people will be interested in – after all, a DVD of interviews is likely to be watched once then forgotten about whereas CDs get listened to a lot more. The sound quality is excellent, so the CDs give a good reproduction of what the fans at the shows experienced. Obviously some Rainbow fans are split over the vocals – I think Ronnie Romero does an excellent job of performing songs made famous by various different singers, including the legendary Ronnie James Dio. Nobody can ever truly replace Dio, and Ronnie Romero isn’t the first singer in Rainbow to have to perform songs made famous with Dio on vocals, but I think he’s a lot better than the others. Fans who accept the new singer are likely to enjoy the new Rainbow, but even there some criticise Blackmore’s guitar playing, saying it’s not as fast as it used to be. Well my response to that is “so what”. Lots of bands modify songs as they age, either to suit an aging vocalist or band members, and Ritchie Blackmore is in his 70s these days. At the live shows, most people were very happy with the performance and many were just grateful to get the chance to hear the songs live for the first time. My view is that people should accept the current band as they are – don’t compare them in microscopic detail to the lineups that were in place when these classic songs were recorded originally. If you accept them as they are then you can start to relax and enjoy hearing these classic songs performed live. For me the real highlight of the show wasn’t a Rainbow song, or a Deep Purple one, it was a Blackmore’s night one. It’s the instrumental, “Carry on Jon”, a tribute to Jon Lord that was accompanied by photos of him on the screen behind the band. It’s a beautiful piece of music, and with the visuals then on the night it really was a moving tribute. Without the visuals you lose some of the impact, but it still stands out as a fantastic instrumental, and it’s noticeable how quiet the crowd are as Blackmore plays the quiet and delicate guitar parts – there’s just a cheer which coincides with when the visuals started – after that people were unusually quiet as they listened and appreciated the tribute. My opinion – a great release that fans who enjoyed the live shows will want to add to their collections.